Getting ready to fire the cannon for the last time. Dan Wood is the first man on the left; his son behind the cannon. Katie Fiorella stands first to the right. June 1, 2013. 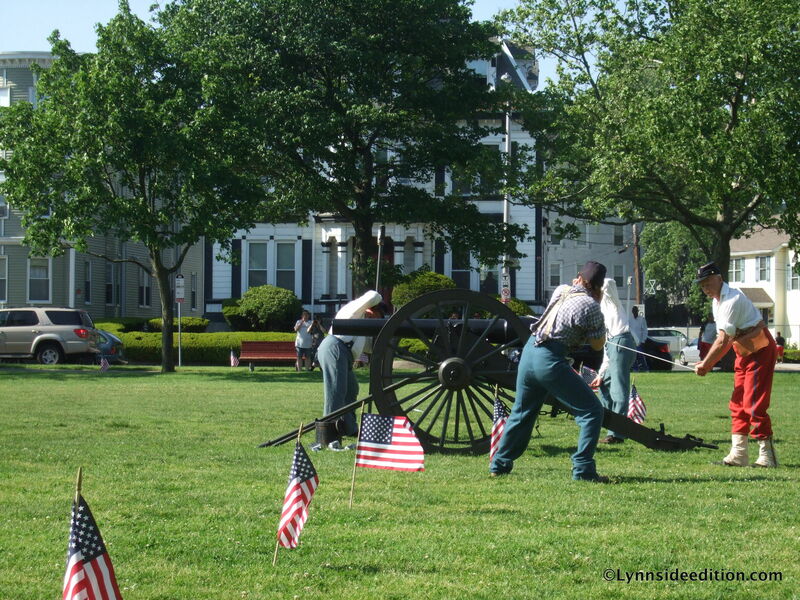 Volunteers portraying members of the 6th Maine Light Artillery regiment wheel the cannon out into the open area of Lynn Common in front of the Frederick Douglass Memorial bandstand. An Infantryman pushes a plunger into the maw of the cannon, packing in the projectile, hopefully nothing lethal. A boy approaches with a satchel, reaches in and hands something to the man at the fuse. The boy stands at attention delivering the charge, then deliberately strides away. Now the man at the fuse is holding a 3 foot length of string coming from the rear end of the cannon and pulls it taut. “Ready!” He shouts. Two infantry on either side of the cannon bend at the waist and twist their upper bodies away, blocking ears with fingers. Boom! All I see is thick smoke now, cannon wheels, but no cannon. 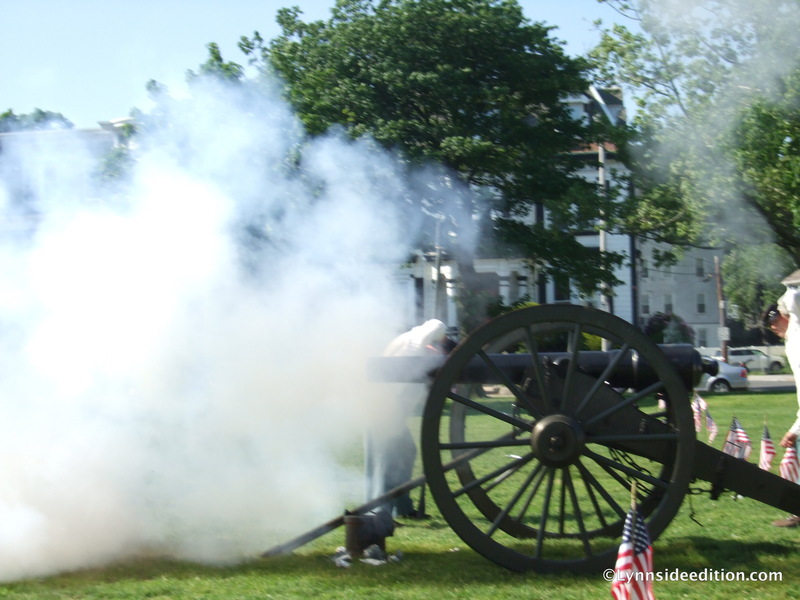 Everyone loves a good cannon firing. 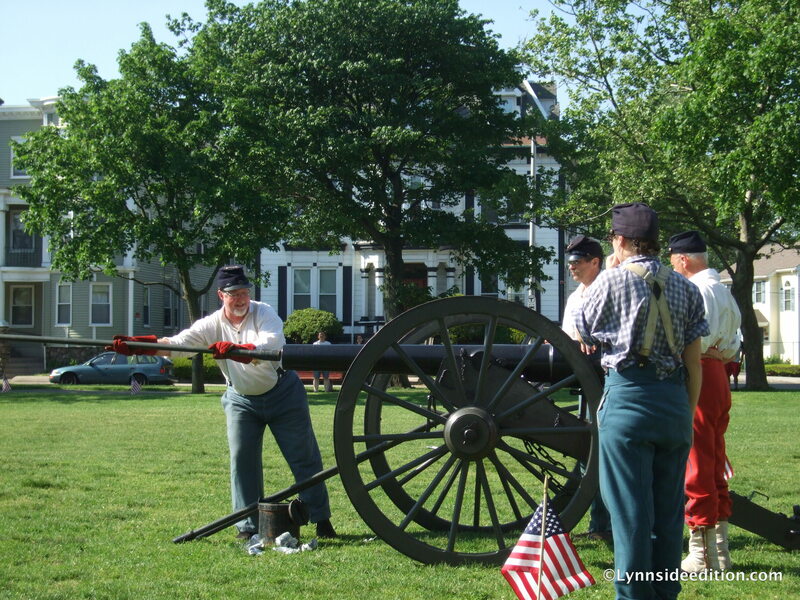 I’d venture to say that firing a Civil War era cannon is a main attraction to the people who dress in period garb to recreate Civil War battles. I’d say another attraction for them is the opportunity to educate the general public about our American heritage. Or maybe some are just history buffs. Dan Wood of Derry, New Hampshire, is the man with the plunger; his 12-year-old son, David, the boy with the satchel. 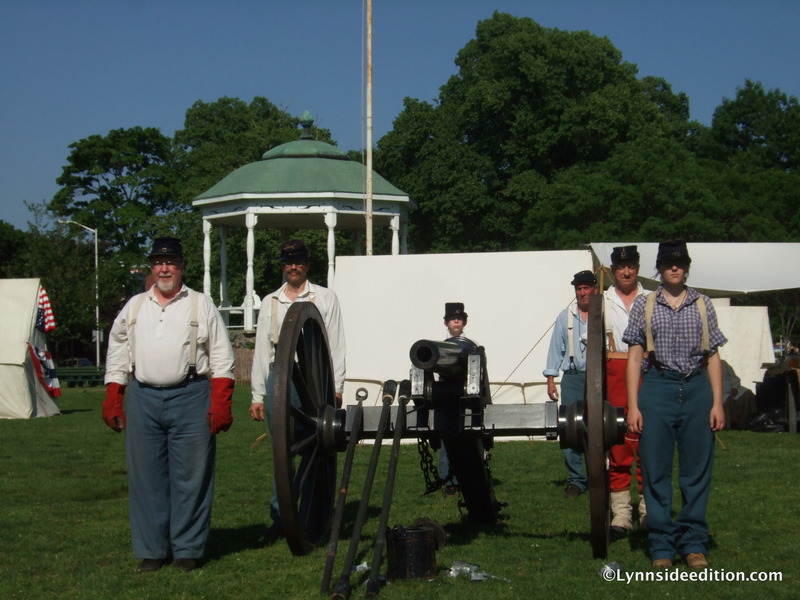 Dan says his son’s interest is why he is here today portraying a member of the 6th Maine Artillery, Battery F. Two years ago, the family attended a festival in Hillsborough, NH, which featured a civil war re-enactment. 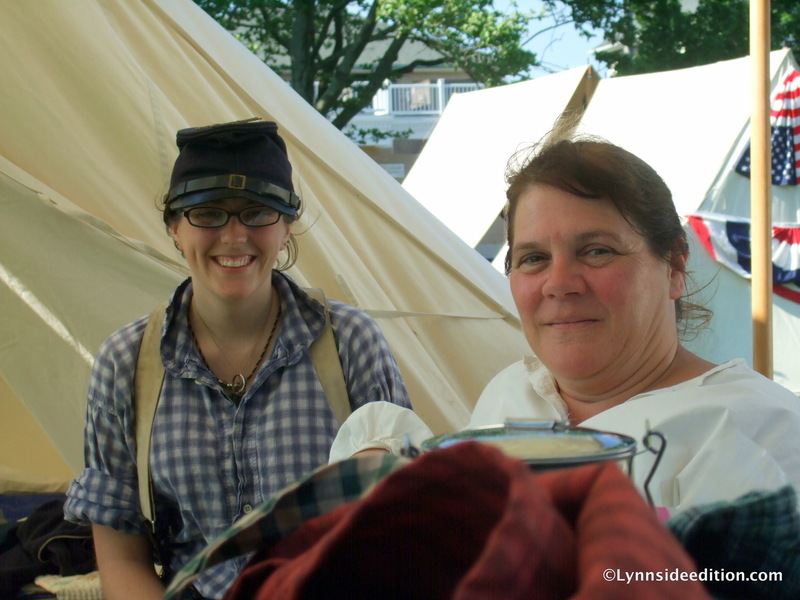 Young David’s interest in this experience of “living history” also led him to play the character of Robert E. Lee in a school assignment. “This is called a Dog Bone. It’s what we use to rig the tents,” she tells a curious boy, holding up a smooth rectangular wooden block with a hole in one side. These are for sale too.